Creativity in education - a critical time. A few words on why I, as a dad, will be marching on Parliament in London tomorrow with my youngest son (last seen on BBC Breakfast TV with a pile of cardboard boxes) where MPs are due to debate the impact of the EBacc on teaching of art and creativity in UK schools. Whether you have kids in state schools or think you’re out of it, having gone private, I suggest you read this, as I know many private schools to that focus blindly on academic subjects and marginalise the arts, at the expense of the children in their care, and their futures. It’s a talk that said ‘Creativity is as important as Literacy’, which itself causes most people to splutter, feeling it devalues literacy when Sir Ken Robinson clearly was trying to elevate the status of the Cinderella that is also know as creativity. How appalled I was when it dawned on me that we had an education system that was in many ways largely unchanged since the day it was designed, specifically to teach people to ‘sit still in factories and offices’ (Seth Godin). A system designed to ensure the smooth replication and rolling out of the human machine to underpin the rolling out of the Empire, a place where ‘creativity wasn’t welcomed’ (Prof Sugata Mitra). How I’d never thought about it before I had kids and how many who have them don’t think about it but how surprised they are when they too look closer. Pause for a moment to have a look at either, or both, of these wonderful films from secondary schools in Marylebone London and Formby, Merseyside that illustrate so well the value of creativity in our schools to our economy and to the community today. Sadly in just a few schools. At a time when it feels that just about everything is up in the air in the UK, who really wants something else to worry about? Well very few people it seems, as no one seems either to have noticed or give a damn about what is happening to our education system. It affects everyone but is barely an election issue beyond the standard soundbyte/headline that contains the words ‘spending more on schools’. Box ticked, move on. Admittedly we’ve recently had the outcry about the forced Academisation of Schools, which led to a slight delaying of the process by another lady who wasn’t for turning. Here’s one reason that this Academisation is backward looking. After much great work by the industry (led by Google’s Eric Schmidt), trade bodies, IT aware teachers and finally government including the department of Schools Minister Nick Gibb who stood up in Parliament recently to stress the importance of coding in schools and reiterated the government commitment to this by saying that coding was now compulsory in all 4 key stages of state maintained schools. So why/how has my eldest son managed to get through Year 7 and 8 in his ‘Ofsted Outstanding’ school without doing any more coding than an hour of Scratch at the local Barclays Bank as part of their Digital Eagles initiative? Because it’s an academy and not bound by the same rules, that’s how. 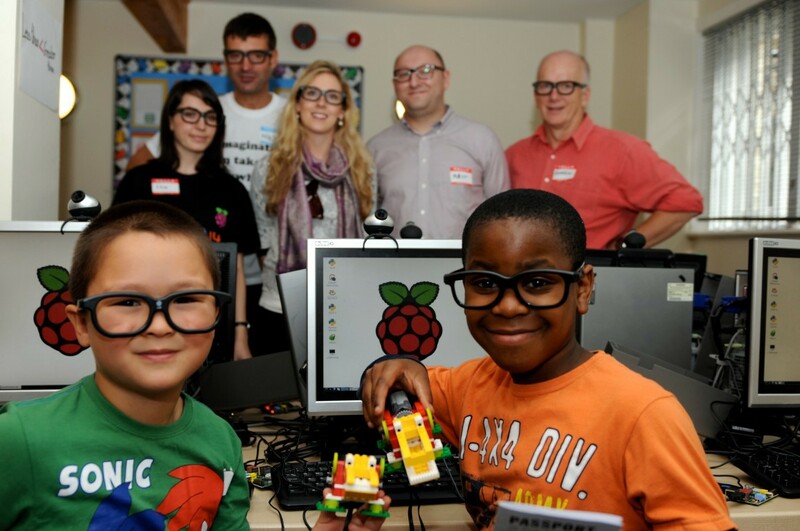 A school that has outstanding teaching and learning in many areas but frankly neglects its children in this core area, possibly pigeon holing coding as a ‘vocational’ activity, not thinking that a science degree at Imperial or Cambridge is as likely as a career in FinTech or games design to require coding experience to enable students to manipulate big data sets in experiments and construct software simulations of reactions. As for many, our secondary transfer was a nail biting time. Looking for a broad and balanced curriculum, we decided against the secondary school we’d targeted and hoped our eldest son would get into as we’d heard they’d dropped Design Technology, albeit it to focus on music. We were then delighted when he was offered a place at what appeared to be a secondary school to die for as we were slightly out of its catchment area. He’d joined over 900 children to apply for one of 25 art aptitude places, and won one in a brand new, £86m school with all the trimmings. Yes, all the trimmings, from breathtaking pool and beautiful bespoke hand crafted furniture to amazing DT facilities. So how disappointed we were when presented with year 9/GCSE study options to have to choose one of DT, Music or Businesses studies with no creative subjects at all offered in Year 10, as if he could turn his creativity off for a year, and flick it back on in Year 11. But we were lucky, we were told that his friend in an academic band above him who’d also won an art aptitude place at the school and who desperately wants to be, and will make an excellent architect has no creative options next year and possibly, neither the year after. But he will have a Latin GCSE certificate to wrap round his slide rule. So imagine our disappointment to then be told a week or so later that in fact DT had been withdrawn as an option, though drama was now being offered. (See the short film here of the impact something as simple and often marginalised as dance can change lives and below the significance of drama in Bill Watkins’ talk). We asked to see the head and were redirected to the deputy head in charge of the curriculum and had the most interesting meeting. We were told that the head of Art and Design had moved on and they hadn’t been able to replace him and wouldn’t be trying any more. It was to be covered by a languages teacher. The expensive state of the art DT equipment was to be mothballed, but they had found a computing teacher, so all was not lost. They said we are unusual as parents, even wanting our children to have access to a broad and balanced curriculum, with the arts and creative subjects well represented. There’s an education job to be done there on parents, that’s for sure, if they want their children educated for the world they’ll be going in to where creativity, collaboration, curiosity and communication will all be as important as literacy. But how many parents, let alone (head) teachers have any idea what the world of work and business is like and needs after a career in academia? I’m convinced this is all down to the EBacc agenda, and in our case not least the fact that the child of a former education secretary and wannabe prime minister will be joining my youngest son in Year 7 at the school thsi September, so maybe this is the perfect opportunity to create the model EBacc school by which all others will be judged? If so, it’s certainly not the one my son applied for. Creativity is GREAT. Isn’t it? I won’t reiterate the great work that organisations like The Creative Industries Federation have done to show the importance and value of creativity to the UK economy, or the work the RSA have done to show its value to society. 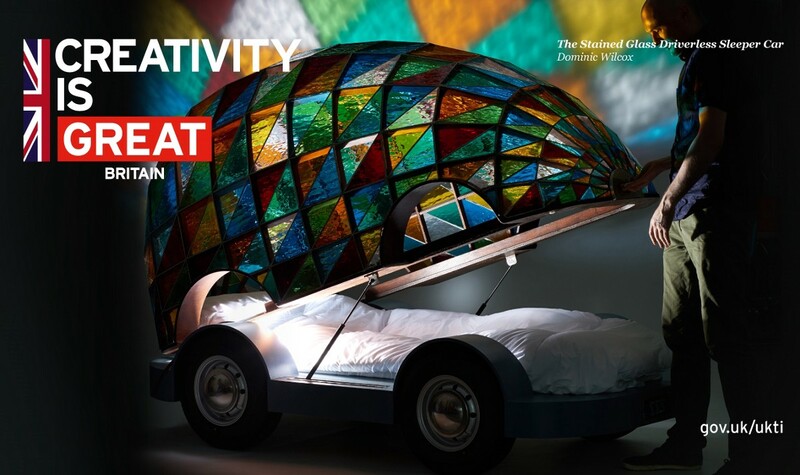 UKTI have a campaign that showcases UK creativity, one poster features Designer, Inventor and STEAM Co. Inspirator Dominic Wilcox who has dedicated a large part of his career to inspire children with his Little Inventors project. Just 4 days after Brexit, The London Evening Standard published an article by the culture minister Ed Vaizey saying how the arts can heal rifts in communities. Is he really with the same government that sets our education policy and that, with the EBacc, risks killing our creative economy? Yes, I am convinced like many others that it’s down to the impact of the EBacc. Whatever government ministers backtrack to say about creativity and the arts being valued, the EBacc forces a one size fits all on children and spits out all who don’t fit. Vocational subjects like technology, engineering (yes read that again) and the arts are relegated to the bottom in the academic race to the top of the PISA tables. For what? Bragging rights at the UN? The above 2 minute talk by Bill Watkin (ex SSAT/SFCA) at the recent STEAM Co. #BlueSkyDOING event in Barclays HQ in Canary Wharf says it all. He sums up how the EBacc is killing the arts and creativity in schools from primary to secondary and what Winston Churchill said. There is hope. Over 10,000 people signed an online petition to force the government to discuss the impact that the EBacc is having on the arts. Only last week a report announced that the decline in art subjects in schools had declined fivefold. That’s significant. We have to get the government to include arts subjects in the EBacc and encourage schools to deliver a broad and balanced curriculum so that every UK child can have and heaven forbid, enjoy an education for the world we live in today, not for a yesterday that has gone forever. 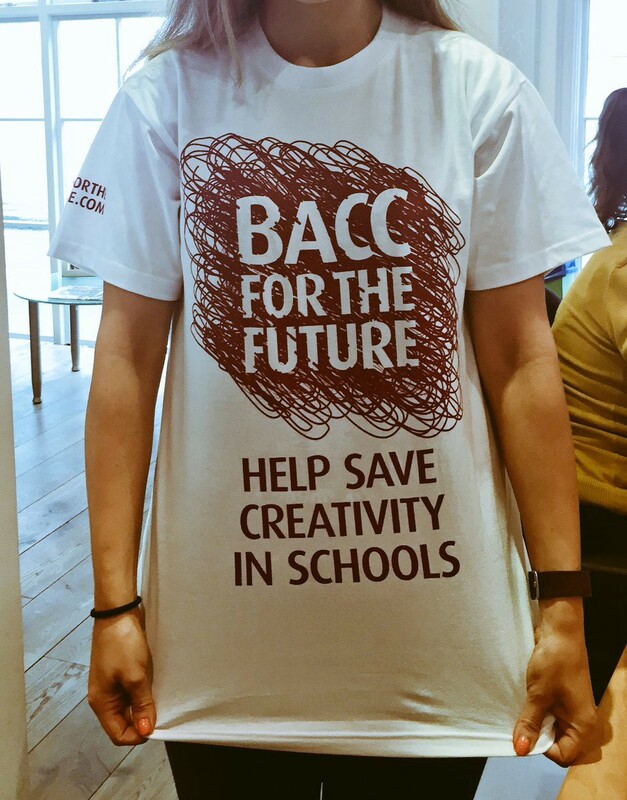 Many think we need a #BaccForTheFuture as proposed by a campaign of the same name led by the Incorporated Society of Musicians. Their CEO, Henry Vann did a great job of putting the case against the EBacc in its current form on BBC Radio 4 in advance of a government debate on the impact of the EBacc on the arts. You can hear on Soundcloud below. That debate is in the Houses of Parliament at 4.30pm on Monday 4th July. Details here. See you there, if you care. And/or write to your MP if you value creativity in education. This is the time. Once again, it’s a one way street. We won’t be coming back up it in a hurry.